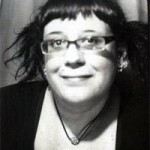 Today’s interview features fellow SF writer cutie Caren Gussoff. Rain, of course (I live in Seattle). I’ve always felt partial to Orion, since he was the first one I learned to identify. I struggle with fairy tales a lot. I like retellings, like Angela Carter’s Bloody Chamber. Out of traditional tales, I like the Rrom tales of Lallah Pombo best. My relationship with my husband. It’s awesome. Caren Gussoff is a speculative fiction writer living in Seattle, WA. Her novels and stories have been published across Europe and the United States. More on her can be gleaned via www.spitkitten.com. This entry was written by Princess Alethea and posted on July 12, 2012 at 5:00 am and filed under Interview. Bookmark the permalink. Follow any comments here with the RSS feed for this post.